Downy mildew is caused by the oomycete Peronospora belbahrii. The disease was first reported on basil in Uganda in 1930, but did not attract international attention until it appeared in several new locations; Italy (2003), France (2004) South Africa (2005), Iran (2006) United States (Florida, 2007) and Argentina (2008). During 2008 and 2009, the disease occurred throughout the east coast in epidemic proportions both in the field and in greenhouses. 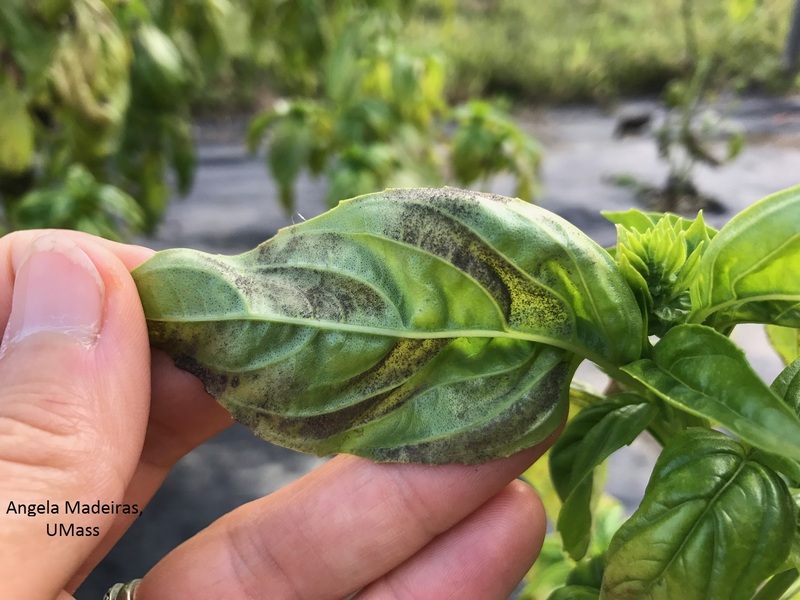 Considerable economic losses occurred in Massachusetts during that time and we anticipate basil downy mildew will be a major disease of basil in the US in the foreseeable future. Long distance transport from FL to MA might be explained by aerial dispersal of spores but rapid transcontinental transport probably occurred via infested seed sold internationally. Although the downy mildew pathogen has been detected in basil seed, seed transmission is probably a rare event. Air-borne dissemination from infected plants is more likely. 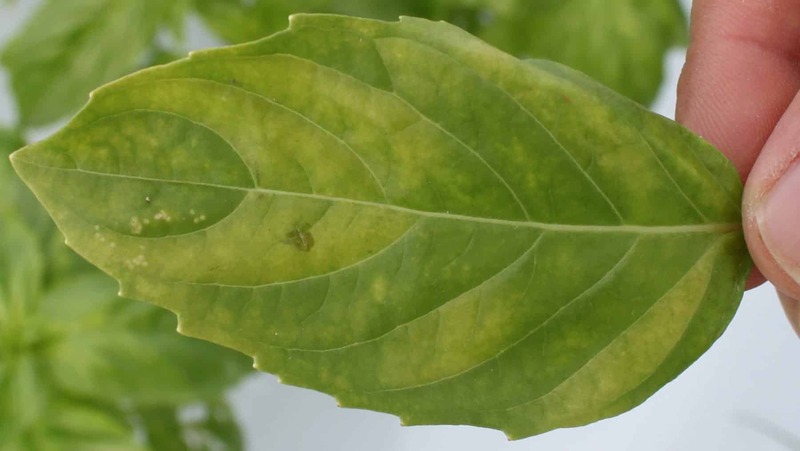 Leaf yellowing is often the first symptom of basil downy mildew. Yellowed areas are usually bordered by leaf veins. When spores are produced, a characteristic fuzzy, dark gray to purple growth on the underside of the leaves is evident. Sporulation on the upper surfaces of leaves may be seen in severe cases. Symptoms of downy mildew on basil can easily be mistaken for a nutritional deficiency. The fuzzy growth of spores on the underside of the leaf may look as if soil had been splashed onto the leaf under-surface. Spores are produced in darkness before sunrise. Sporulation occurs at 50-78°F and >85% relative humidity (RH). Spores are borne at the ends of tiny tree-like structures called sporangiophores which grow out of the stomata. The spores are dispersed by wind and splashing water. On wet leaves at temperatures from 41 to 83°F, spores germinate within 2 hours and infect plant tissue within 4 hours. Five to 10 days may elapse between infection and the appearance of symptoms; the duration of the latency period depends upon temperature and light exposure. Basil downy mildew is unable to survive winter temperatures in the northeastern US. Toward evening, heat and vent the greenhouse, especially when warm days are followed by cool nights. Improve horizontal air flow by the use of fans. Run fans at night. Fans may be connected to sensors that will turn them on when the RH reaches 70% and turn them off when it drops below 65%. Reduce plant canopy density by spacing to speed leaf drying. Water in the morning, if practical, or use drip irrigation rather than overhead. While sporangiophores can be formed in light or darkness, spore production requires a period of darkness. Exposing infected plants to red light (λ 575-660 nm) at night inhibits spore production. Some crop loss may be incurred, as sporangiophores can still emerge from the leaves; however, the reduction in spore production can help prevent the pathogen from spreading to uninfected plants. In the field, plant in well drained sites with good air drainage and orient rows with the prevailing winds. Control weeds and space plants to enhance leaf drying. Grow tolerant cultivars. Classic Genovese types of basil are highly susceptible to downy mildew. No truly resistant cultivars are yet available; ‘Eleonora’, ‘Everleaf’, “Tuscany’, and ‘Caesar’ are tolerant. Field trials conducted in southern New Jersey in 2009 determined that commonly-grown sweet basil (Ocimum basilicum) cultivars such as 'Poppy Joe' and 'Nufar' were the most susceptible to downy mildew. The least susceptible basils included the lemon and spice types such as O. x citriodorum and O. americanum cultivars , ‘Lemon Std’, ‘Lemon’, ‘Lime’, ‘Spice’, ‘Blue Spice’ and ‘Blue Spice Fil’. Few fungicides are labeled for herb plants and there are differences in registrations for field grown plants versus greenhouse plants. Check the labels on individual products. Copper products, phosphonates, cyazofamid, mandipropamid, oxathiapiprolin, and azoxystrobin are labeled for use on basil. Many organic products are also labeled for use on basil but efficacy data is lacking. Both conventional and organic products should be used in a preventative manner to protect plants from infection, as few have any curative properties. It is the grower’s responsibility to read and follow label instructions. Be sure that a particular product is registered for use in your state. The label is the law and any recommendations made here are superseded by the label.